Passing on convenience foods and choosing to make things from scratch is a great way to not only save money, but also to reduce your carbon footprint. When we prepare foods with bulk dried ingredients or local produce we reduce the demand for the many resources required to package, refrigerate, and ship foods. We also make our grandmas proud! 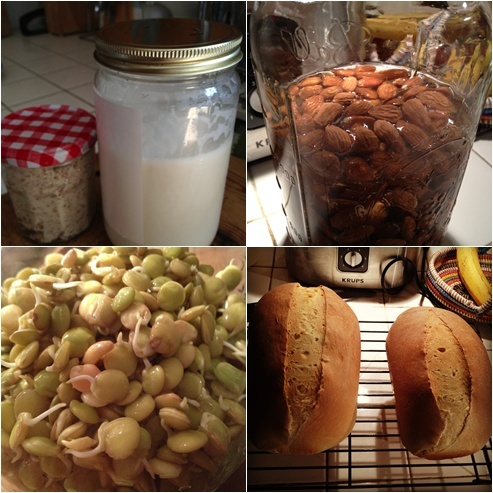 Recent food projects: Almond meal and milk, soaking almonds, sprouts, and bread. Make your own cereal. My favorite breakfast is one of steel cut oats served with simple fruit and nuts topping or made following Fat-free Vegan's pie-like recipes with cooked fruit . I also love this savory granola recipe from Brooklyn's Early Bird Foods. Skip cans and buy dried beans in bulk instead. Chez Bettay has great instructions on how to sort, pre-soak, cook, and freeze several varieties of beans. Oh My Veggies shows how to make beans in a slow cooker. Legumes like lentils and split peas don't require pre-soaking and have a short cooking time, meaning they're pretty popular in my house especially this recipe for lentil chili. Speaking of beans, why not grow your own bean sprouts? It was supereasy for a beginner like me to make lentil sprouts following these instructions from For the Love of Food. Make your own milk. Keeping a pet cow or goat isn't realistic for most of us, but we can all make nutritious plant-based milks from coconut, soy beans, or nuts. I recently made almond milk following wonderful video instruction from Anita of Electric Blue Baking Company. It was easy and deeeeelicious, at least twice as good as anything packaged. Bake your own bread. While there is some artistry involved, it isn't required; even less-than-perfect fresh baked bread tastes amazing! I've tried these recipes: Basic White Sandwich Bread, No Knead Whole Wheat Sandwich Bread, and a Simple Whole Wheat Sandwich Bread. I can't wait to try this recipe for tasty oatmeal bread by Ian of PVD's Secret Door Projects. Can your own tomatoes. These Canning 101 instructions from SimpleBites make it seem so easy! Make your own yogurt. Cassie at Back to Her Roots shares simple instructions for dairy yogurt and a vegan-friendly recipe for making homemade fruit-on-the-bottom individual yogurt cups. Vegans, check out this recipe for dairy-free yogurt in a crock-pot from Sayward at Bonzai Aprodite. Make your own condiments. It's not only eco-friendly, but healthier since you can make them without high fructose corn syrup or preservatives. Check out these recipes for: ketchup from fresh tomatoes, vegan and soy-free mayonnaisse, whole-grain mustard, and hot sauce. Brew your own kombucha. All the cool kids are drinking $4 disposable bottles of it, but you can be the coolest kid by following this kombucha recipe. The Hip Girl's Guide to Homemaking by Kate Payne (Kindle or Paperback) has lots of info on home canning and ideas for preparing food at home. I love Kate and her book! I don't own a canning kit, but once my garden gets growing I plan to invest in this 7 piece home canning set made with stainless steel instead of plastic. Another helpful tool for making preserves like ketchup from fresh tomatoes is a food mill. This OXO Good Grips Food Mill looks great! I love all their gadgets! My list of green alternatives to plastic food storage containers. What foods and drinks do you make yourself to save money and resources? Share a recipe or idea in the comments.